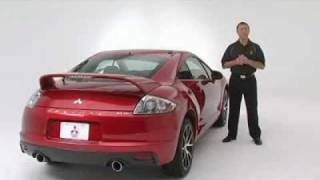 Mitsubishi celebrates Eclipse Model Legacy with the 2012 Special Edition Eclipse Coupe and Spyder, which were available at the New York Auto Show. 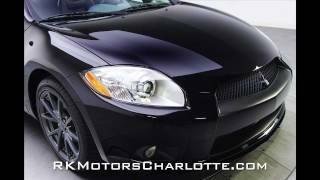 The special edition Eclipse features a 265 horsepower, 3.8-liter SOHC MIVEC 24-valve V-6 that is mated to a 5-speed automatic transmission that makes use of Mitsubishi's Sportronic® transmission technology, allowing the driver to manually select gearshifts when so desired. From its early days as a sleekly-styled, turbocharged-4-cylinder boy racer model, right up through to its current design as a sophisticated yet distinctive-looking two-door with available V-6 power, the Mitsubishi Eclipse Coupe and Eclipse Spyder have long been tailor-made for the true driving enthusiast. But after a long and successful run as the Japanese auto manufacturer's signature luxury performance sports coupe in North America, the always fun-to-drive Mitsubishi Eclipse will cease production after the upcoming 2012 model year. 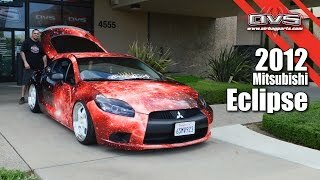 To mark the occasion, the outgoing 2012 Mitsubishi Eclipse Coupe and Eclipse Spyder will be available in a unique SE Special Edition that will feature eye-catching exterior features including special "SE" side decaling, black side mirrors and handsome 18-in. dark finish alloy wheels, along with the extensive list of high-end standard features that can be found on the Eclipse GS-Sport versions of both the hardtop and convertible models. Included amenities on the amply-equipped Eclipse GS-Sport models are a 4-speed automatic transmission, leather seating with heated front seats and a power driver's seat, rearview camera, Bluetooth® hands-free phone access, HID headlights with fog lamps, heated side mirrors and an exquisite sounding 9 speaker, 650-watt Rockford Fosgate® premium audio system with SIRIUS® satellite radio. The coupe version of the Eclipse GS-Sport includes a sunroof as well. 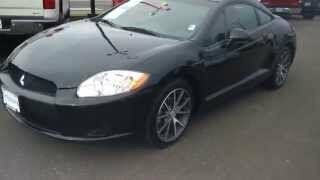 The most affordably-priced version of the Eclipse remains the GS Coupe model. No-cost features include a 6 speaker 140-watt AM/FM/CD player with MP3 playing capability and an auxiliary audio input jack, air conditioning, 6 airbags, dual exhaust, blacked-out roof, 18-in. alloy wheels and automatic shut off headlights. The Eclipse GS Coupe comes equipped with a smooth-shifting 5-speed manual while a 4-speed automatic transmission is available as an option. Powering all of these aforementioned Eclipse Coupe and Spyder models is a very capable 162 horsepower, normally-aspirated 2.4-liter SOHC MIVEC 16-valve inline 4-cylinder engine. 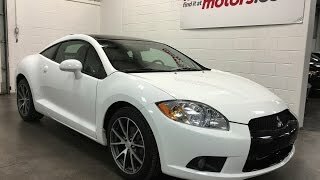 The top-of-the-line Eclipse GT Coupe and Spyder editions feature a 265 horsepower, 3.8-liter SOHC MIVEC 24-valve V-6 that is mated to a 5-speed automatic transmission that makes use of Mitsubishi's Sportronic® transmission technology, allowing the driver to manually select gearshifts when so desired. An automatic climate control system is also an included feature on all Eclipse GT models. Standard safety equipment on all Eclipse models includes 4-wheel disc anti-lock brakes (ABS) with Electronic Brake-force Distribution (EBD); Active Stability Control (ASC) and Traction Control Logic (TCL); and advanced dual front air bag supplemental restraint system (SRS) and side air bags. Side curtain air bags are included on the Eclipse Coupe.